Tips to help you estimate the age and date of your antique clock. Dating Antique Clocks can be an exact science providing you have the right reference books and the proper experience. However, if you don’t there are various little things that can help when dating antique clocks. Like knowing when certain features were introduced or certain materials became available. A few simple things that can point you in the right direction and at the correct period for your antique wall clock, advertising clock or bracket clock. The construction of various parts can and will help in dating your antique clock. Specifically the style and type of clock hand and the dial, both of which have varied over time. 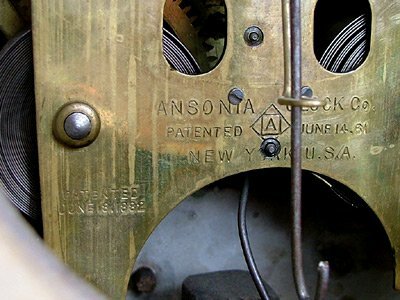 Even the type of material used to construct your antique clock movement can help, or discovering when chimes were introduced and the type of chime used. c1836 – gold electroplating was introduced and became popular within a few years. It provided a safe alternative to the hazardous use of mercury in gilding metals, which was banned c1799. c1660 – calendar movements were introduced to English longcase clocks. The first American patent issued for a calendar movement was in 1853.
c1806 – machine made wood screws were introduced in France as early as 1806.
c1800 – reverse-painted glass tablets date from the early 1800’s. c1820 – wooden movements were generally used in early American shelf clocks until around 1820. Up until then hand cast and finished brass movements were very expensive. Chauncy Jerome began manufacturing cheap 30-hour brass movements in the 1830’s; by the early 1840’s brass movements virtually replaced wooden ones. c1840 – coiled wire gongs were used in English bracket (shelf) clocks. 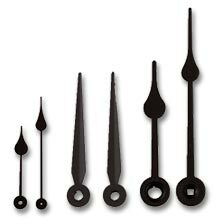 c1890 – chime bars, also called chime rods, were introduced to clocks. They are metal rods specially tuned to produce a sequence of chime notes when struck by the movement’s chime hammers. c1869 – celluloid was patented. Adamantine celluloid veneer was patented in 1880.
c1882 – Seth thomas introduced clock models in Adamantine veneer finishes which mimicked marble, slate, wood grains and other materials. c1910 – Bakelite an early inflammable, mouldable plastic, was invented. Belgian born scientist Dr. Leo Baekeland, founded the Bakelite Corporation around 1910. It reached its height of popularity in the 1930’s and 40’s and was used in a wide variety of consumer products. c1896 – marking the country of origin was required on clocks imported into the United States; e.g. Made in England or England, Made in France, France, etc. c1901 – saw the introduction of the Anniversary trademark on 400-Day clocks. c1905 – Plywood was first used. c1663 – minute hands were introduced to longcase clocks. c1775 – matching minute and hour hands were introduced; Although antique clocks were produced with only hour hands until around 1820.
c1780 – second hands began to be added to longcase clock dials. c1745 – phases of the moon were introduced on clock dials . c1792 – paper clock dials were introduced and applied to a wooden or metal backing. c1800 – painted dials came into general use on clock faces. Signatures on an antique clocks dial or movement can sometimes help to date a clock. Providing you can find the clock makers name and the date of activity listed in one of the many guides accessible to watch and clockmakers. However, a signature may refer to someone other than the clockmaker. 19th century retailers and distributors often put their own names on clocks as an attempt to brand their product. The actual clock movement may have been made by someone else, as until the 19th century clock cases were almost always made separately from the movement and were rarely signed. And, of course, a signature may be fraudulently added as an attempt to increase an antique clocks value. Now you have some good information, check out our antique clocks for sale section to help find that beautiful antique clock.